The Lloyd Center for the Environment has received a $15,000 grant from the Island Foundation in support of the Center’s Climate Science Learning Project (CSLP) launched in Fall River’s public schools and schools in Greater New Bedford last year. 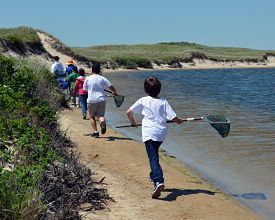 Aligned with the Massachusetts curriculum frameworks in science and engineering, the CSLP focuses on the projected effects of climate change on local biodiversity, introducing age-appropriate math, writing, critical thinking and life skills into core climate science lessons. The project is using and expanding existing Fall River program structures, involving visits from Lloyd Center naturalists/educators to 3rd and 5th grade classes. As part of the CSLP, fifth-grade students from Fall River and Greater New Bedford are currently assisting the Lloyd Center in the documentation of potential impacts of climate change on local wildlife, working side-by-side with Lloyd Center research scientists. The students are also helping to create a web-based climate science education tool with the data they collect as participants in the project. A key objective of this work is to involve students in activities that inspire a passion for science, while facilitating discovery of the significant relationship between human communities and natural systems. Thanks to the support of the Island Foundation, the CSLP is standardizing the curriculum as the project moves into its second year, through a comprehensive, hands-on biodiversity research project, appropriate to the age and education levels of each student.